The records offer evidence of private, high-level meetings at the Trump International Hotel in Washington and lavish dinners. WASHINGTON — Newly obtained internal documents from the Environmental Protection Agency provide a behind-the-scenes look at the Scott Pruitt-led agency — offering evidence of private, high-level meetings at the Trump International Hotel in Washington and lavish dinners for top agency officials both at home and abroad. The Hotel Eden's fine dining restaurant, La Terrazza, offers a tasting menu for 280 Euros per person ($333.76, U.S.). A schedule indicates Pruitt's dining partners for the evening included his chief of staff Ryan Jackson, and Samantha Dravis, his former senior counsel who resigned abruptly last month. Previously reported agency records show that Pruitt's entire Italy trip cost around $120,000. However, the new documents, which were first reported by The New York Times, suggest that official events comprised only a small portion of his Italy trip. Pruitt — who rose to prominence as Oklahoma’s attorney general — is now facing at least a dozen investigations into allegations of misuse of taxpayer money, ethics violations and improper dealings with industry lobbyists. The documents suggest that Pruitt's old Oklahoma political connections still have his ear and curry favor. In a May 2017 email exchange, former Pruitt fundraiser Tamara Cornell asks the EPA administrator to address the Global Warming Policy Foundation, a climate-change denying organization. 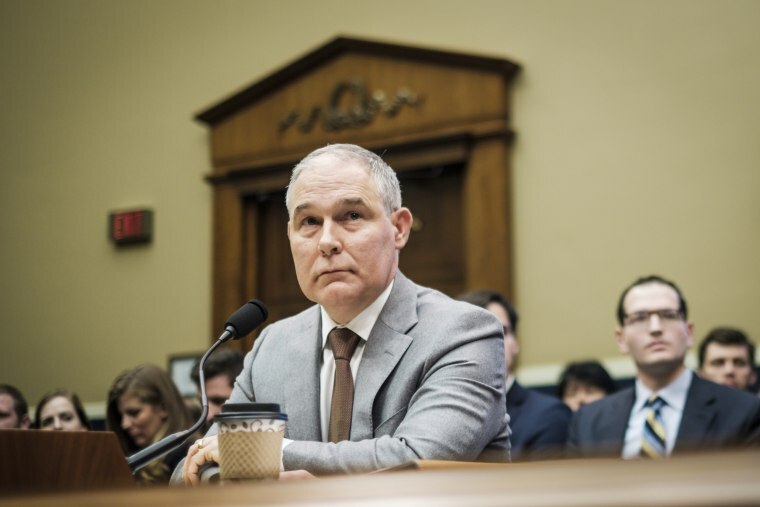 The documents also show that on at least four occasions Pruitt planned meetings with energy company representatives at the Trump International Hotel in Washington, which is located near EPA headquarters. One revelation included in the documents supports recent reporting about Pruitt's penchant for using his security detail's lights and sirens to cut through Washington traffic in non-emergency situations — including while rushing to dinner at the upscale Washington restaurant Le Diplomate. In an October 2017 email exchange — as Pruitt’s executive scheduler Sydney Hupp tries to arrange a dinner for her boss and D.C. energy lobbyist Mike McKenna — Hupp replies, "Le Diplomate is his favorite!" The Times reported a security agent was removed from Pruitt's detail shortly after he told the EPA chief the siren was only for emergencies. Sierra Club Executive Director Michael Brune said the newly obtained EPA documents "expose a deeply rooted culture of corruption surrounding Scott Pruitt and his dealings in essentially every aspect of his job." Brune added: "Scott Pruitt doesn't live in the swamp — he is the swamp — and he should resign, or be fired immediately." The EPA did not respond to NBC News' request for comment. Gary Grumbach and Michelle Dubert contributed to this report.